For breeds such as French Lops – British Giant – Flemish Giant etc…Made from redwood and exterior graded ply. Comprises of three independent wooden sections which fit together. The rabbit hutch roof is removable to avail easier access to the rabbit hutch for cleaning. The solid door on the right can be altered to a wire door if preferred. Just ask. No charge! 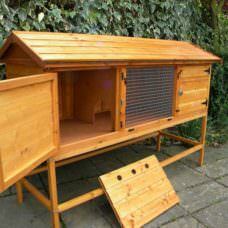 The rabbit hutch run has six removable lids which are held in place with turn buttons. There is also a doorway at the end of the rabbit hutch run so as to allow your pet into the garden area if desired. 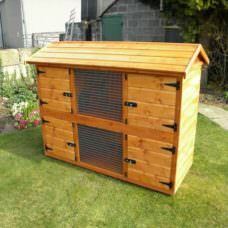 Longer rabbit hutch runs are available. Just ask!